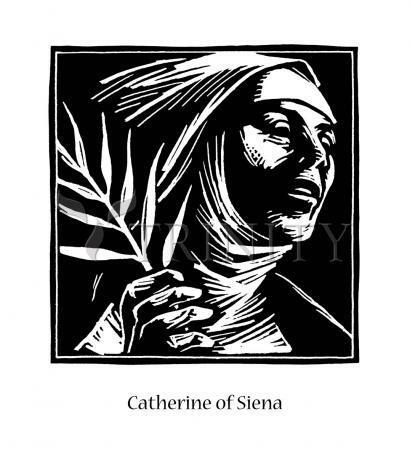 Proclaimed a Doctor of the Church in 1970, St. Catherine of Siena was a counselor to Pope Gregory XI and Pope Urban VI. "Work…in the field you see God calling you to work in, and don’t trouble or weary your spirit over what is said to you but carry on courageously. Fear and serve God selflessly, and then don’t be bothered by what people say, except to have compassion on them." Her feast day is April 29. Catherine was the 23rd child of Jacopo and Lapa Benincasa and grew up as an intelligent, cheerful and intensely religious person. Catherine disappointed her mother by cutting off her hair as a protest against being overly encouraged to improve her appearance in order to attract a husband. Her father ordered her to be left in peace and she was given a room of her own for prayer and meditation. She entered the Dominican Third Order at 18 and spent the next three years in seclusion, prayer and austerity. Gradually a group of followers gathered around her -- men and women, priests and religious. An active public apostolate grew out of her contemplative life. Her letters, mostly for spiritual instruction and encouragement of her followers, began to take more and more note of public affairs. Opposition and slander resulted from her mixing fearlessly with the world and speaking with the candor and authority of one completely committed to Christ. She was cleared of all charges at the Dominican General Chapter of 1374. Her public influence reached great heights because of her evident holiness, her membership in the Dominican Third Order, and the deep impression she made on the pope. She worked tirelessly for the crusade against the Turks and for peace between Florence and the pope. Someone has said that "God made us because he loves stories." Saints allow God’s love to flow through them. Through their witness God shows to humanity his presence and his face. Saints inspire us, guide us, encourage us and remind us of what God can do through human beings. St. Catherine of Siena said that "All the way to heaven is heaven because Christ is the way." She strongly believed that we are bonded with the risen Christ in a union so deep that we form one body. In her relationship with Jesus She lived out the words of St. Paul; "I no longer live, but Christ lives in me" (Gal.2:20). This mystical communion that was at the heart of St. Catherine’s spirituality inspired her to reach out to the poor and suffering of Siena. When the Black Death swept through her city, she had no hesitation in caring for the victims. She worked as a nurse. She dug graves for those who died of the plague and then buried them properly herself. She accompanied prisoners who were condemned to death to the place of execution waiting with them and praying for them to the end. Eternal Trinity, Godhead, mystery deep as the sea, you could give me no greater gift than the gift of yourself. For you are a fire ever burning and never consumed, which itself consumes all the selfish love that fills my being. Yes, you are a fire that takes away the coldness, illuminates the mind with its light, and causes me to know your truth. And I know that you are beauty and wisdom itself. The food of angels, you gave yourself to man in the fire of your love.